True or False: Cognitive decline is an inevitable part of aging. True or False: As we age, our work productivity declines. True or False: Older people are sadder and lonelier than their younger counterparts. You can probably guess where we are heading with this—all of the statements are false but are pervasively touted as true. Aging has been caricatured as a time of increasing loneliness, and decreasing productivity, cognitive health and vitality. However, growing research from leading institutions around the world has dispelled these aging myths. Contrary to aging being a time of gradual decline and loss of enjoyment, research is suggests that older adults are actually happier than their younger counterparts. Friendships and relationships with others are actually deeper, more intimate, and more fulfilling in older age. While it is true that older adults more often experience losses of close loved ones, it’s also true that older adults report greater satisfaction with life and wellbeing in relationships. Depression is more common in older adults (FALSE): Research out of the Stanford Center on Longevity has shown that reported wellbeing actually increases into adults’ 70s, and then it starts to level off. 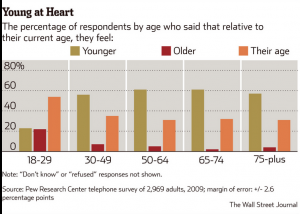 In fact, the emotional “peak” (i.e., one’s happiest times) statistically doesn’t happen until adults reach their 70s. Older adults can all expect their brains to decline steadily as they age (FALSE): While it’s true that structural changes in the brain that occur because of aging (e.g., shrinking of the prefrontal cortex) can have impacts on cognitive processes such as reaction time and memory, it’s also true that (excluding dementia cases) older adults perform better in the real world than on cognitive tests. Even more exciting, recent studies have shown that it’s possible to enhance one’s cognitive function with intentional brain boosting activities. Older adults in the workforce are less productive (FALSE). Stereotypes about the productivity of older workers are especially damaging because they can impact the ability of older adults (who make up 22% of the North American workforce) to find and secure employment. However, empirically there is no relationship between age and job performance. In fact, research has shown that in positions where experience is an important skill, older adults performed better than their younger counterparts. Check out our past post for more information on dispelling aging myths. What aging myths are you busting in your own life?